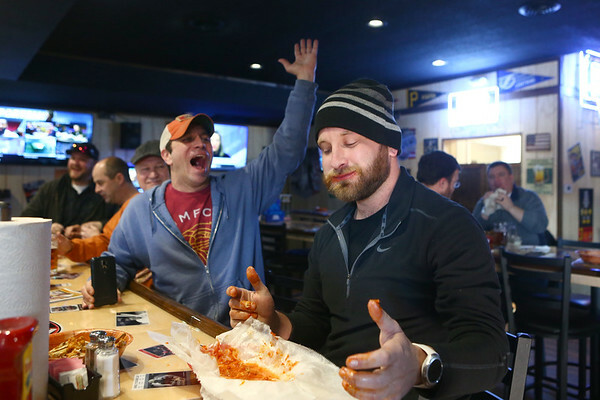 Zane Brooks looks down at his empty wing basket as his co-worker Jay Soldi cheers after Brooks is the first person to complete the Wall Challenge at the new Wings Etc. in Peru February 14, 2017. The Wall-sauce is the hottest sauce at Wings Etc. and to complete the challenge, the participant has to eat 16 wings covered in the Wall-sauce without drinking anything, eating anything else, or using napkins. Brooks completed the challenge within the first hour of Peru's Wings Etc. grand opening on Tuesday.